Berchtesgaden (not sure how to pronounce but I think I heard 'buck-tis-ga-den' on the bus) was the last destination we added on our itinerary for this trip. As mentioned in my previous post, our initial plan was to make a trip Lake Bled in Slovenia but getting there was too much of a hassle so we ended up looking for an alternative destination for a day trip from Salzburg. Came across this small German town 30km south of Salzburg, and considering that we were already in the Bavaria region, we figured we should at least spend a day in Germany and enjoy some German food and beer. Hubby still wants a Germany-only trip so this was just a brief intro, we'll save the rest for the next trip (who knows when). Took the 8.15am RVO Bus #840 from Salzburg Hbf to Berchtesgaden. We bought the all-day pass (Tagesticket) for €9.80/pax ($11) from the bus driver, which covered all our transportation to and from Salzburg and all the local buses in Berchtesgaden. A one-way ticket would have costed €4.70 so it's a no-brainer to get the all-day ticket. I was quite surprised that the bus was almost full with tourists (and a dog) doing the same thing as us, majority young Asians our age, we're definitely a generation of 'DIY' travellers. Arrived Berchtesgaden bus station after 45 minutes. It's a small bus/train station and all the buses coincide their timing with the tourist route so it's hard to get lost. As soon as we hopped off bus 840, we hopped back on to bus 841 that goes directly to our first stop for the day (Lake Königssee) in just 10 minutes. The scenery of the Alps surrounding the lake is known to be picturesque but you would have to take the boat ride to see it. Even before we started the trip, we've decided that we would give this boat ride a pass and just walk around Königssee Village and see the lake from the boat dock. It was only about 9.30am when we got there and most shops were still closed and the surrounding was quiet, tranquil and cold (the sun wasn't up yet). Typically waters around boat docks are a lil' polluted but not this one, the waters were crystal clear...literally!! As we were leaving, we saw the electric ferry silently pulled into the dock to pick up the first batch of visitors for the day. The 1-hour guided tour costs €16/pax ($18). We changed into our miner's outfit, got an English audio guide, and off we went on the salt train ride that brought us deep into the underground mine. To be honest, I wasn't really interested in the 'educational' aspect of the tour but it was fun sliding down the wooden miner slides and taking a boat ride in the underground lake. If you're wondering how an underground lake looks like, it's the bottom right photo (p.s. I wasn't supposed to take photos but this was too cool not to share). :P The water was so still with perfect reflection of the 'ceiling' it didn't even look like there was water at all! It was 1pm by the time we finished the salt mine tour, just in time for lunch at the nearby Braustüberl Beer Hall, 10 min walk from the salt mine. Btw, it's never too early for a beer in Germany...haha!! After a good experience at the beer hall in Salzburg the day before, we were looking forward to another good meal/beer hall experience at this local beer brewery...especially since we're in Germany. We ordered the Berchtesgadener beer, roasted potatoes, sausage, roasted chicken, sauerkraut, and a dessert. These may not look fancy but everything was so good, the beer, the food...yummsss!! Our last stop in Berchtesgaden before heading back to Salzburg was the Market Street (MarktStraße)...a pedestrian only shopping area filled with local authentic shops. Bought a heart-shaped pastry to celebrate our anniversary. =P One thing I realized on our bus back to Salzburg...the entire bus was filled with Asians apart from 3 ang mohs (including hubby)...and this was a public bus. At that point I felt like I was traveling in Asia instead of Europe...lol!! 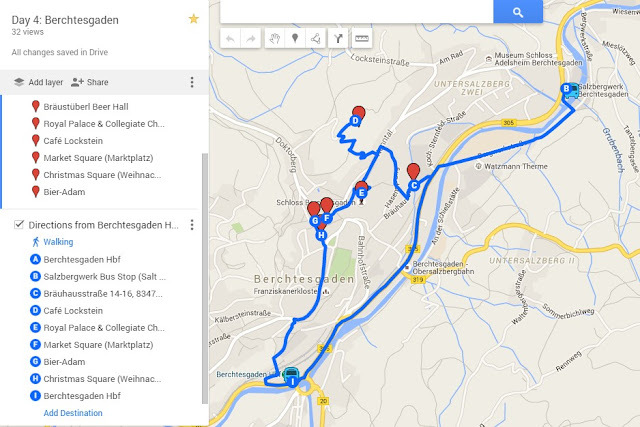 Last but not least, here's the google maps link for our sightseeing route in Berchtesgaden.